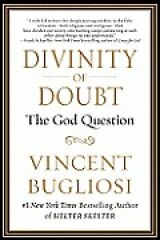 For all those who believe that there is a inverse relationship between intelligence and religious belief, famed Los Angeles County prosecutor Vincent Bugliosi, provides ammunition in his sure-to-be controversial book on religion "Divinity of Doubt: The God Question" (Vanguard Press, 352 pages, $26.99). In a note to Chapter 9, he cites an article in Mensa Magazine (Mensa is the international organization for high-IQ people): "Of 43 studies carried out since 1927 on the relationship between religious belief and one's intelligence and/or educational level, all but four found an inverse connection. That is, the higher one's intelligence or educational level, the less one is likely to be religious." Note to readers: be sure and read the notes. They are really helpful. Another study cited by the lawyer who prosecuted the Manson Family and co-wrote with Curt Gentry the all-time best-selling true crime book about it, "Helter Skelter," measures the religiosity of nations and their dysfunction. It turns out, to nobody's surprise -- certainly not mine -- that the U.S. is the most religious of 17 nations in a study published in the online journal Evolutionary Psychology, June 2009, (pages 224-225 in Bugliosi's book) and is also the most dysfunctional, followed by Australia, with New Zealand and Spain tied for third. The least dysfunctional nation was Norway (ranked seventh out of seventeen in the least religious of nations studied). Denmark was second in the list of least dysfunctional nations and ranked third in the least religious of nations. Sweden was third in the least dysfunctional category and ranks as the least religious nation of the 17 studied. Holland was fourth in the least dysfunctional nation list and ranked eighth in the list of least religious of nations. Bugliosi: "This study clearly shows a correlation between religiosity and the dysfunction of a nation. And the lowest rates of dysfunction are found among the most irreligious of countries. I know that Benjamin Disraeli said there were three types of lies -- lies, damned lies, and statistics -- but I don't believe that. Statistics don't lie, although the interpretation put on them may. Moreover, with the terrible history we all know that ardent religiosity has given rise to, we really shouldn't be too surprised by the results of the study." Amen, and let me be the first to make a connection between intelligence and education and dysfunction and plain old dumbness. As a nation, the U.S. is in many ways dumber than a bagful of hammers, as witnessed by our embrace of the most dogmatic forms of religion, including the Roman Catholicism that Bugliosi was indoctrinated in his hometown of Hibbing, Minnesota, and what he calls "Holy Roller" fundamental Protestant Christianity, and playing the "God Card" at every opportunity. Bugliosi really lays into Catholicism in Chapter 12 "The Catholic Church: Great, Grand, and Silly" (all of his chapter titles are laced with humor, a quality I've largely found lacking in the most religious of people.) In Chapter 18, "Hey, Look at Us, We're Just as Silly as They Are" Bugliosi examines Judaism, Islam, Buddhism, and Hinduism and finds they're just as contradictory and, yes, silly as in fairy tales for adults because they're so far-fetched that kids wouldn't accept them. Vince Bugliosi may be agnostic when it comes to the existence of God, but he sounds atheist when it comes down to accepting the religious rules of the game. Early in the book, which is written in a delightfully conversational style, Bugliosi takes on atheism and the current Big Three writers on atheism (Chapter 4, Atheism and Its Current Leading Prolocutors" beginning on Page 39): Richard Dawkins, "The God Delusion;" Christopher Hitchens, "God Is Not Great," and Sam Harris, "The End of Faith: Religion, Terror, and the Future of Reason." Chapter 4 is worth a close reading; my initial impression based on the first reading is that the three "prolocutors" of atheism examined by Bugliosi are not as harmful as true believers or theists. He takes apart their arguments, but my impression is that Bugliosi doesn't consider atheists as harmful as theists-- especially the more fanatic of theists, including Crusading Roman Catholics or convert to Islam or die by the sword types. In his incendiary chapter on Catholicism, he cites the corruption of the church, evident today from the sexual abuse cases that have roiled the church and which have reached all the way to the current pope, Joseph Ratzinger, Pope Benedict XVI, who covered up priestly sexual abuse cases when he was Archbishop of Munich in the 1980s. He also deals with the complicity of the Church with the Nazis and their failure to excommunicate Adolf Hitler, who proudly proclaimed his Catholicism to the end of the Third Reich. Los Angeles Cardinal Roger Mahony, who was replaced this year as spiritual leader of the four million Roman Catholics in the Los Angeles area. also covered up sexual abuse by priests. Mahony is slammed by Bugliosi for erecting a Taj Mahal of a cathedral in downtown Los Angeles. The $250 million Cathedral Our Lady of Angels (I call it Our Lady of the Freeways because of its downtown L.A. location at 555 W. Temple St. with its great views of the Pasadena, Harbor and Hollywood freeways) drew criticism to Mahony, from both within the Church and outside, who argued that there were at least two alternatives to replace the existing St. Vibiana's, condemned because of seismic deficiencies. The current Showtime series "The Borgias," is also mentioned by Bugliosi as "the first crime family." What can you say about Rodrigo Borgia, beautifully played by Jeremy Irons, who after he becomes Pope Alexander VI in 1492, anoints his son Cesare as Archbishop of Valencia -- Cesare is a student and all of 17 years old -- and marries off his beautiful blonde daughter Lucrezia to a man he despises to cement a political alliance. No, Rodrigo wasn't married; his four children were from his alliance with his mistress. Priestly celibacy? More honored in the breach than the observance! Occupying the middle ground -- the delightful New Orleans term for a parkway strip is "Neutral Ground" -- means that those on both extremes -- atheists and theists -- are equally accessible to him and able conveniently to hurl epithets. Still, agnosticism seems to me to be a logical way to discuss the unknowable. Bugliosi is nothing if not logical. He's also an admirer, as I am, of cats, and everybody of similar inclination should pay close attention to his discussion -- on pages 70-74 -- of his relationship to his "egg", his lilac point Siamese cat Sherlock: "he's a good egg" is the old expression for a great person, or cat, a being superior to most people by cat lovers. My shorthand for this obsession is "The more I see of people, the more I appreciate cats." Sherlock, good "egg" that he was, reminds me of our beloved California cat Peach and our Texas shelter cat Greta. I doubt that Bugliosi will convert either true believers or atheists to his agnosticism, but "Divinity of Doubt" is worth reading by those of every persuasion. For agnostics, it will provide arguing points and reinforce their view that their position is the best available. I doubt that many fundamentalists, -- the people who really need a dose of reality -- will read this book, but I'm guessing that quite a few atheists will give it a whirl. Vincent Bugliosi, born in Hibbing, MN in 1934, received his law degree in 1964. He and his wife, Gail, live in Pasadena, CA. In his career at the L.A. County District Attorney's office, he successfully prosecuted 105 out of 106 felony jury trials, including 21 murder convictions without a single loss. His most famous trial, the Charles Manson case, became the basis of his classic, Helter Skelter, the biggest selling true-crime book in publishing history. Two of Bugliosi's other books--And the Sea Will Tell and Outrage--also reached #1 on the New York Times hardcover bestseller list. No other American true-crime writer has ever had more than one book that achieved this ranking. The Prosecution of George W. Bush for Murder was likewise a New York Times bestseller, and Reclaiming History: The Assassination of President John F. Kennedy has been heralded as epic and a book for the ages. HBO, in association with Tom Hanks's PlayTone Productions, will be producing this as a ten-hour mini-series to be aired in 2013, the 50th anniversary of JFK's assassination. Learn more about "Divinity of Doubt" at www.divinityofdoubt.com.